In the next few minute, I am going to go back home via Metro Line #4. There are two stations of the line, and both are "near" to where I work. 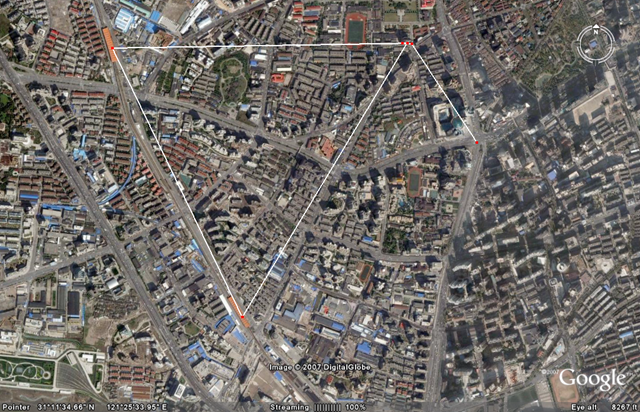 In the map below: The one on the left top corner is the Metro Line #4 Hongqiao Rd. Station, and the one on the lower left is Metro Line #4 Yishan Rd. Station. The red point on the top right is where I work. (BTW, the other dot in the middle of the right is the Xujiahui Station of Metro Line #1). Which station I should go? It seems to Yishan Rd. Station, it is 1.36 km, and to Hongqiao Rd. Station, it is 1.44 km. This is the sad life of "living near BOTH stations", and this description is for my first rented apartment in Shanghai – near both stations of Metro Line #1, but not near enough to any of them. OK. I am going home. jst take any station with cheaper ticket fare..
Hehe. This is exactly the problem to have too many choices. Looks like Yishan is further than measured by direct line because of the configuration of the streets. Maybe you can walk from one station in the morning and return to another station in the evening! Does it seem to you that the Google Earth and Google Maps aerials of China are outdated? By how many years? Even 2 years can be a long time in Shanghai it seems.